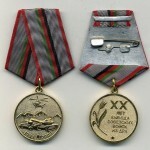 Until the beginning of an Afghanistan war USSR had no clear pattern of an award for soldiers – participants of international military operations. 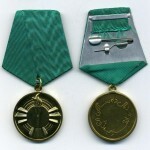 First idea of creating of an Afghanistan medal of honor appeared in 1979 after the war has started. 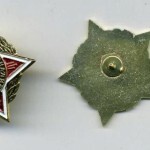 Since 1979 Soviet soldiers were awarded by several medals that were used earlier (including WWII military medals), but at the same time special character of the operation didn’t allow the medals to reflect outstanding actions of soldiers in a full way. 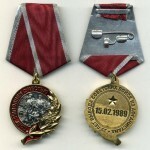 First official medal that was created to be awarded for fulfilling an international military duty was introduced in 1988. 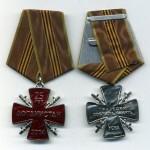 Since 3rd of March 1989 around 505 000 of medals had been issued. 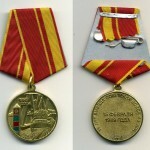 The medal indeed was not an Afghanistan medal of honor but it became a respectable award and an element of a uniform of Soviet soldiers who took part in different kinds of international military operations in such countries as Afghanistan, Korea, Syria, Angola, Egypt etc. 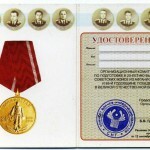 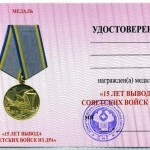 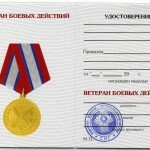 Each medal was accompanied by a certificate verified by soviet officials. 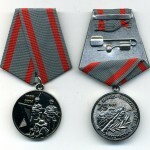 Republic of Afghanistan issued first medal for foreign military partners on 15th of May 1988. 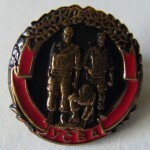 This date coincides with the first day of Soviet army withdrawal from Jalalabad. 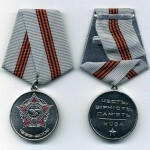 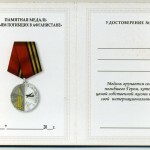 The medal was awarded to all Soviet soldiers who made a contribution in solving military conflict of the country. 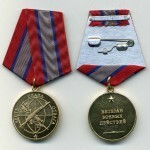 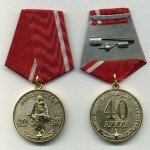 Through the medal was recognized and respected in the USSR it cannot be considered as Russian military award because it was designed and issued by Afghanistan. 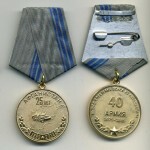 The design was made especially for USSR servicemen. 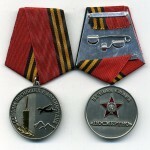 On an averse of the medal there were two flags: Soviet flag and a flag of Republic of Afghanistan, both placed above mountains and a rising sun. 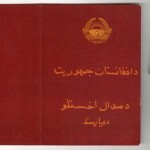 On central part of reverse there was a writing: “from a thankful nation of Afghanistan” . 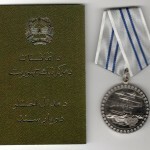 The award is not issued by Afghanistan any more. 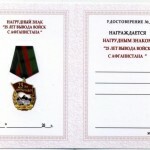 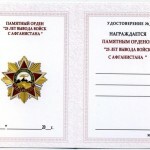 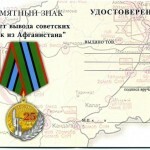 Even after several years from the end of Afghanistan war passed — organizations of veterans of Afghanistan war and representatives of official governmental formations in former Soviet countries have continued to issue military awards, decorations and several types of an Afghanistan medal of honor. 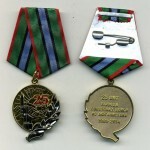 International organizations that unite military veterans of Afghanistan war within several countries have issued several medals in honor of remarkable dates of the war. 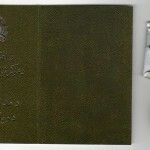 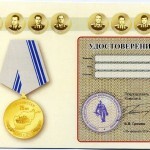 Each of them is carefully designed and usually contains symbols widely used for former USSR awards. 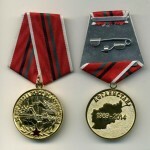 Organization of former Soviet fighters of Afghanistan with special needs designed a medal to celebrate 15th anniversary of evacuation of Soviet army from territory of Afghanistan. 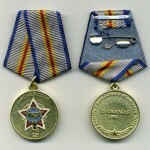 On the averse of the medal there is a star (former Soviet army symbol) and a tulip, that is widely used for awards to participants of Afghanistan war. 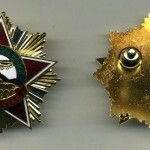 Several countries of former USSR that took part in Afghanistan war designed their national sign and medal of honor to be awarded to former participants of the war. 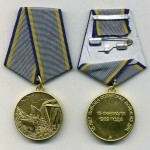 For the moment there’s a wide variety of medals that are dedicated to war in Afghanistan and that were issued on international or national basis. 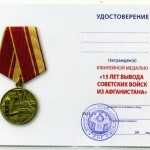 It’s very possible that new military awards will be designed soon by governmental and social organizations to be awarded to veterans of Afghanistan war. 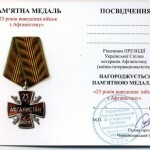 Collection of Afghanistan medals and military awards is not very wide but it grows according to active position of former participants. 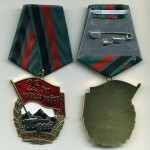 Current collection may include Afghanistan war badge, sign, decoration, certificate and medal of honor. 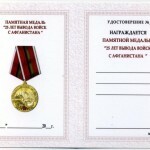 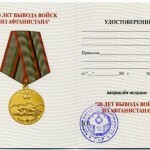 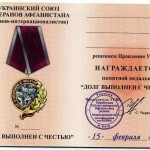 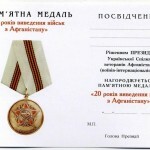 Interest of collectors of Russian and Soviet awards to those that are connected with war in Afghanistan is constantly growing.